The tag 'eurozone' is associated with 68 posts. Germany’s Debt is More than Double that of Greece’s! A recent article in Forbes underscores the flawed accounting underlying the lethal fiscal policy imposed on the citizens of the “cradle of democracy.” An unconventional accounting method has been used to calculate that Greek debt is 175% of GDP, the statistical foundation for the crushing austerity that afflicts that country. In fact, it is 18%, when calculated using the standard “Ipsas” accounting method. Germany’s on the other hand, is 46%, when calculated under that standard! All of the contents of this website as of 12/19/2014–Dave Emory’s 35+ years of research and broadcasting–as well as hours of videotaped lectures are available on a 32GB flash drive. Dave offers his programs and articles for free–your support is very much appreciated. The New World Ordoliberalism Part 5: The TLTRO and Waiting for Godot. And Sanity. With European Union continuing its slow steady fall into deflation, the question of “what’s to be done?” has becoming a permanent fixture for European policy-makers. But for the eurozone, with it’s shared monetary system, the question is a much more complicated “what should we all be doing together?”. The answer to that latter question, unfortunately, has consistently been “not enough”, despite prior promises. Still, the ECB hasn’t given up entirely in its attempts to reflate the eurozone. Back in June, the ECB decided to inject another 400 billion euros into the eurozone banking system in a two-phase loan program. And as we’ll see below, in both phases the eurozone banks wanted far less than what was offered while continuing to pay back their previous loans. In other words, while the ECB has been trying the expand the monetary base in the eurozone’s financial markets that monetary base has continued to shrink. As the excerpt below puts it, it’s like ‘Waiting for Godot‘. And as we’ll see at the end, it really IS like Waiting for Godot, theatrics and all. This broadcast illustrates the deep political relationships that evolved from the Third Reich’s formal military occupation of Europe. These relationships are inextricably linked with the remarkable and deadly Bormann capital network that forms the basis of much of Mr. Emory’s analytical paradigm. Taken in concert, they help to illustrate what Mr. Emory means by “Underground Reich.” Angela Merkel’s selection of austerity advocate Jean-Claude Juncker as President of the European Union Commission will see a long-time German ally and son of a Wehrmacht combatant ascend to the pinnacle of EU governorship. 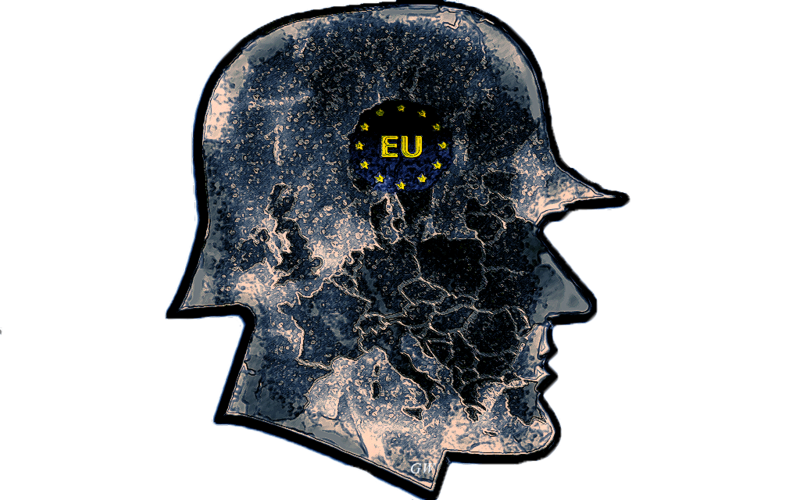 The connections dominating the background and character of the Germanophile Juncker track back to the Nazi occupation of Luxembourg during World War II and cartel connections that facilitated the Third Reich’s amoeba-like absorption of the European economy. During the Nazi occupation, Luxembourg’s economy was folded into “Europa Germanica,” with Gustav Koenigs, Chairman of the Bush-Family linked Hamburg-Amerika Line and Secretary of State of the Third Reich overseeing the steel cartel ARBED and much of Luxembourg’s other business. After the war, Luxembourg continued to be a primary element of the Bormann capital network. The future of health care in societies subjected to the doctrine of “Austeria” may be seen with the appointment of doctrinaire neo-Nazi Makis “The Hammer” Voridis as Health Minister of Greece. Fascism is surging in a Europe subjected to German-mandated austerity, as evidenced by the recent EU Parliamentary elections. Much of the program highlights fascism marching under the deceptive banner of “freedom” and/or libertarianism. Bitcoin continues its march toward monopoly, with the mysterious Ghash.io controlling 51% of the market. Gun-wielding fascists supportive of “libertarian” (read “white-supremacist”) Ron Paul gunned down police in Las Vegas, while so called “sovereign citizens” shot up police in California. “Cliven Bundists” (supporters of Cliven Bundy) have declared themselves exempt from Bureau of Land Management regulations in Nevada, as the GOP ramps up another government shutdown to foil Obama’s climate change legislation. At the same time, the very high-tech giants that complained so loudly about Obama’s failure to protect individual privacy are surging ahead with programs and technology to obliterate that very consideration. We’ve told you so–over and over and (present-participle, expletive deleted) over again! Fascism is descending over much of the world. In Europe, the economic conditions deriving from the Euro-austerity doctrine mandated by Germany are bearing fruit similar to the harvest of the 1930’s brought about by the Great Depression.